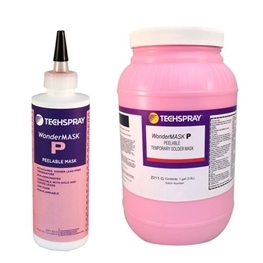 Techspray’s WonderMASK is the industry leading temporary solder mask brand because of quality and versatility. 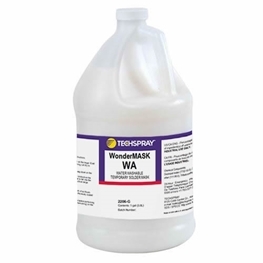 Depending on the product, mask can be peeled off manually or washed off in a batch or inline system. 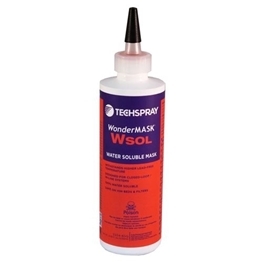 Thru-hole masking – Prevent soldering open holes in a wave soldering process by covering with WonderMASK. All of the masks listed below are well suited for this application. 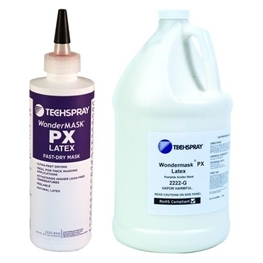 Conformal coating masking – In a conformal coating dipping or spraying process, WonderMASK can be used to cover connectors and other components and areas that should not be coated. WonderMASK P and PX are recommended. 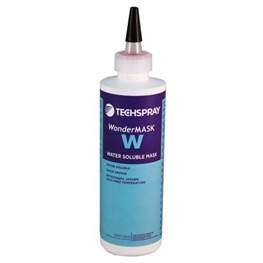 Temporary component adhesive – WonderMASK can be used to tack down components on double-sided PCBs. Non-ammoniated, low odor peelable mask - Prevent soldering protected areas in a wave soldering process by applying a Peelable Solder Mask. Thes products are designed to apply smoothly, dry quickly, withstand high lead-free process temperatures and then be removed easily.